The 34.1 metre motor yacht Trevia is sold as Jason Dunbar at Luke Brown Yachts closes on his listing for sale with MacGregor Yachts in Palm Beach representing the buyer. Built in aluminium by US yard Broward Marine, she was delivered in 1999 and new main engines and generators were fitted in 2007. Accommodation is for up to nine guests in four cabins configured as a master suite, VIP suite and two guest cabins, all with en suite facilities. The main saloon has a granite-top bar and entertainment area immediately to port while across to starboard is a U-shaped sofa with a wood and glass topped coffee table. Forward in the saloon is a formal dining table for eight guests and there are built-in buffet cabinets of maple with cherry and ebony inlays for trays, glasses, dishes and silverware storage. The galley is a beautiful 'country kitchen' with upgraded appliances and Corian countertops and the entire saloon is surrounded by oversized windows, including floor-to-ceiling windows looking to the aft deck. Twin 1,670hp Caterpillar engines give her a cruising speed of 17 knots. 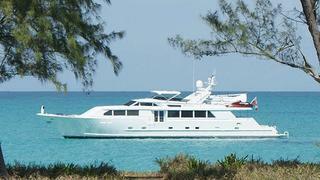 Lying in Fort Lauderdale, Florida, Trevia was asking $1,795,000.